Perfect poached chicken is tender, soft, juicy, and flavorful. Use our easy, straight-forward recipe for the best poached chicken breast or chicken thighs. 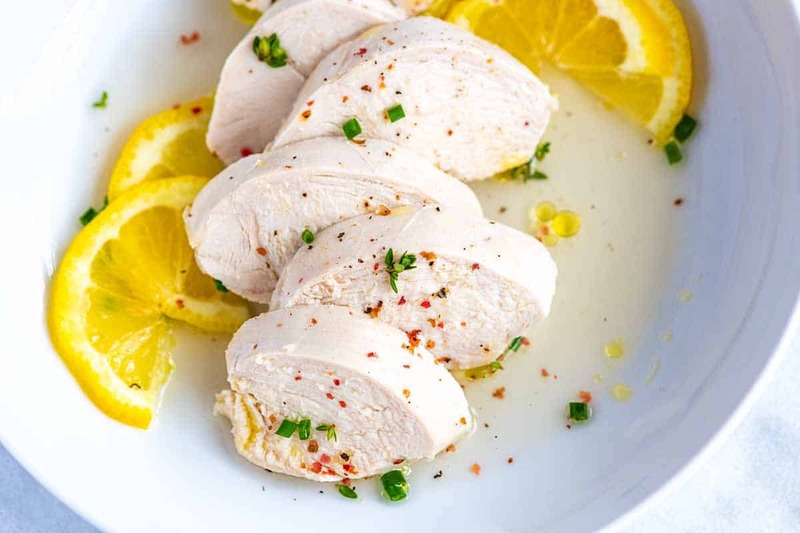 Jump to the Poached Chicken Recipe or read on to see all of our detailed tips. We’ve already shown you how we make tender shredded chicken. To make shredded chicken, we simmer chicken thighs in a combination of water, spices, and garlic. After about 1 hour, the chicken is incredibly tender and easy to pull apart or shred. While poaching is a similar process, it is a little different and takes a bit less time. 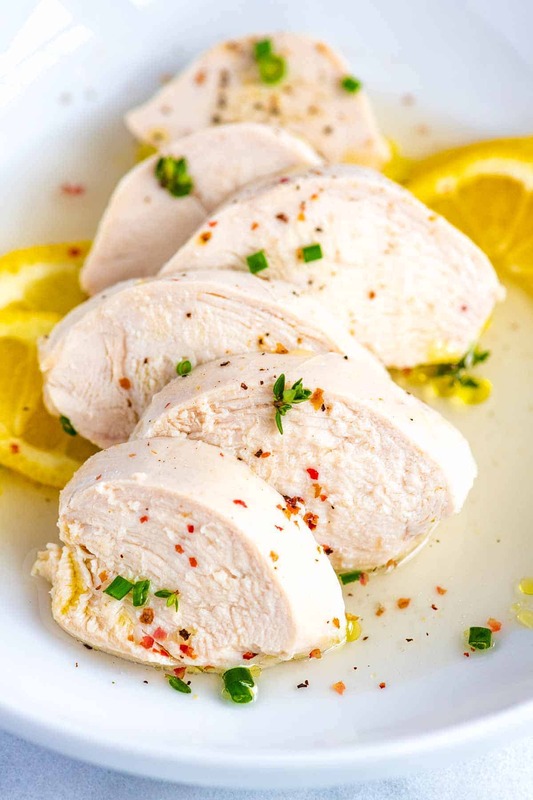 We especially love this poaching method for chicken breast. The chicken stays lean, and the texture turns soft, juicy, and tender. Use the poached chicken to make the best chicken salad, a topper for rice bowls, or enchiladas and tacos. Water, stock, or broth — we typically use water, but for more flavor, chicken or vegetable stock will work nicely. 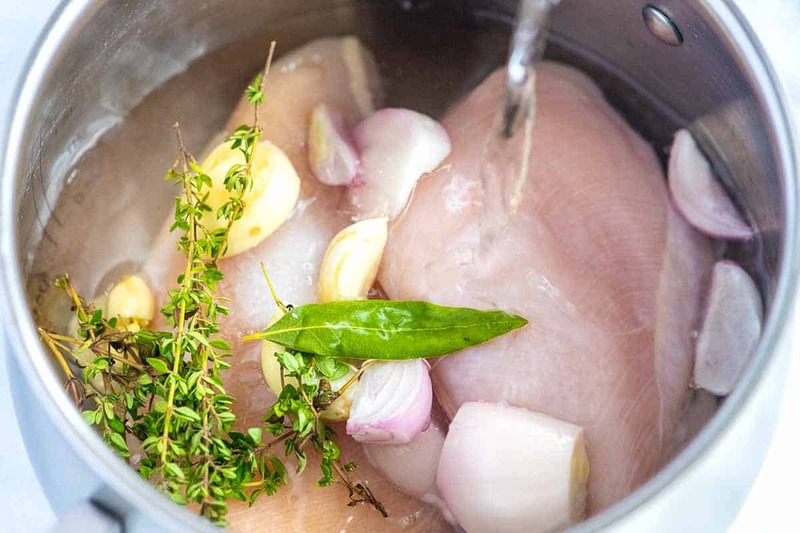 Aromatics like garlic, shallots, ginger, bay leaves, or fresh herbs — The combination of aromatics is up to you and can be adapted based on how you plan to use the poached chicken. For example, if you plan to add it to a Mexican-inspired rice bowl, combine garlic, cilantro, and some cumin. Adding ginger would be excellent for more Asian-inspired dishes. Salt is a must. 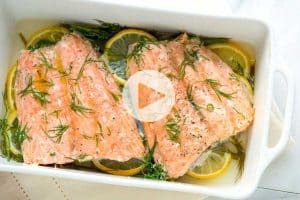 By adding salt to the poaching liquid, you make sure that the cooked chicken is ultra-flavorful and perfectly seasoned. Add the chicken, aromatics, and salt to a pot. Wait, without increasing the heat until the cooking liquid comes to a very low simmer. This will take a few minutes, and makes sure the chicken stays soft and tender. Increasing the heat at this point to speed up the simmer can make the chicken tough. Lower the heat and cook until the chicken is cooked through (about 10 to 15 more minutes). Transfer the chicken to a cutting board and let rest for a few minutes. Slice and serve. And that’s it, simply poached chicken that’s tender and flavorful. Here’s your new favorite chicken salad. Poached chicken is the perfect base. 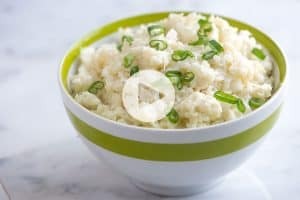 Top your favorite rice and grain bowls. Poached chicken would make this buffalo chicken rice bowl an extra easy dinner. Add it to salads! I adore this strawberry iceberg salad and love adding a few slices of perfectly cooked and tender chicken. Poached chicken is tender, soft, juicy, and flavorful. Use our easy, straight-forward recipe for chicken breast or chicken thighs. You can use skin-on chicken and remove the skin before serving. The aromatics suggested in the recipe are a guide. Ginger, chili peppers, additional herbs, onion, fennel, and carrots are all excellent options. Add chicken, garlic, shallot, bay leaf, thyme, and the salt to a medium pot. Cover with water by an inch or two, 5 to 6 cups. Place the pot over medium heat and heat until the liquid comes to a low simmer. This will take a few minutes. For the most tender poached chicken, don’t try to rush this step. When the liquid is at a low simmer, turn down the heat to low and cook until the chicken is cooked through, 10 to 15 minutes. 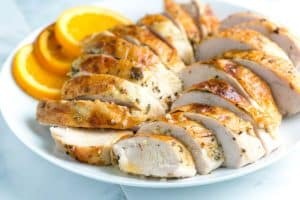 To check for doneness, an internal thermometer inserted into the thickest part of the chicken should read 165 degrees Fahrenheit, and the juices will run clear when you pierce the chicken with a knife. Transfer to a cutting board. Slice and serve. If you do not plan on eating the chicken straightaway, skip the slicing and store tightly covered in the refrigerator. The chicken will keep 3 to 4 days in the fridge. Taste sooo good. I even make an egg drop soup to the remaining chicken stock because it taste so good. This recipe for poached chicken is, indeed, perfect. The instructions are clear and easy to follow. 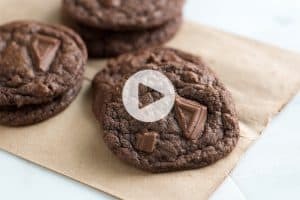 It’s a keeper and a ‘no fail’ kind of recipe. I will use it all the time. Thank you! Do you simmer it covered or uncovered? Thanks :-).